The UHC rankings group includes more than 100 of the major teaching hospitals across the country. 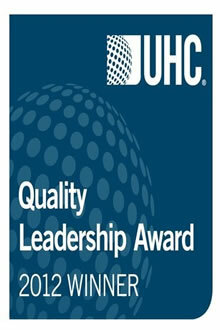 University HealthSystem Consortium (UHC), a national organization comprised of most of the nation’s leading medical centers focusing on excellence in quality and safety, has ranked Emory University Hospital (combined with Emory University Orthopaedics & Spine Hospital) second and Emory University Hospital Midtown sixth in the 2012 UHC Quality Leadership Awards. This is the first time UHC has ever had two hospitals from one health care system rank in the national top 10. Last year, Emory University Hospital (and joint facility Emory University Orthopaedics & Spine Hospital) ranked 10th and Emory University Hospital Midtown ranked 11th. The announcement was made at the 2012 UHC Annual Conference in Orlando, Florida, on Thursday, Sept. 13. The UHC rankings rigorously look at how major teaching hospitals are doing in multiple dimensions of quality and safety, and are traditionally looked upon as providing the best, most non-biased national quality measurement system available for teaching hospitals. Formed in 1984, UHC is an alliance of 116 leading academic medical centers and 276 of their affiliated hospitals representing a majority of the nation's academic medical centers. "Since 2006, Emory Healthcare has been on a journey to make improvements that will redefine the quality of care delivered to our patients," says John T. Fox, president and chief executive officer of Emory Healthcare. "The UHC quality metrics helped provide a roadmap that has helped us to perform more effectively for the patients and families we serve. The main reason these rankings are important is that they are indicative of our significant improvements in achieving high survival rates, infection rate reductions, substantial reduction of ventilator-acquired pneumonia, and many other quality, safety, efficiency and patient service indicators," explains Fox. "One of the highest forms of recognition for an academic medical center is to be a leader in quality amongst our peers across the country," says William Bornstein, chief quality and medical officer for Emory Healthcare. "The improvements we have made in quality, safety and cost-effectiveness over the years prove that we are delivering exceptional care through collaboration and teamwork." Academic medical centers, which often serve as community safety net hospitals, typically treat America's sickest, most complex patient cases, and a disproportionate number of patients who are uninsured, underinsured, or indigent. Additionally, Emory’s hospitals, like many of these institutions, are centers for cutting-edge scientific research and biomedical innovation and training, leading the way for tomorrow's treatments and cures.